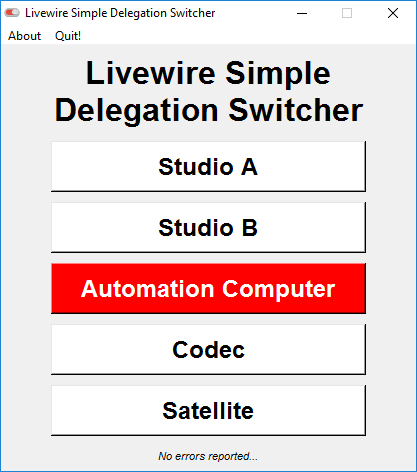 Livewire Simple Delegation Switcher (lwSDS) is a freeware Livewire Source Selector. You can select any Livewire Source on your network, and send it to any xNode, Classic Node, QoR, PowerStation, IP-Driver, or Omnia Processor. Originally released in July 2017, lwSDS has had over 435 downloads and is in use by radio and TV stations all over the world! Livewire Simple Delegation Switcher acts as a single button-selector window. You can think of it like a simple Pathfinder Mini panel, or the press buttons on the front of your old analog audio switcher. The software consists of a single configuration file and EXE. You can setup as many selector buttons as you like. Each one represents a Livewire Stream Number. As soon as you click on a button, it sends that Livewire stream to the configured destination. The active source has a red coloured background. Your sources could be studios, computers, codecs, satellite feeds – anything! As long as it exists on your network as an Axia Livewire source, you can use it. The application uses the Livewire Routing Protocol – a TCP based protocol with simple text commands. It does not require access to the Multicast data on your Axia Livewire network, so you can use it from any separate network – so long as TCP port 93 is accessible. This software does not require a central server, yet you can still run it on as many computers as you like at any one time. The software subscribes to route change notifications on the Livewire device, so as soon as you change the stream number in one place, it shows up on every other computer running this software. 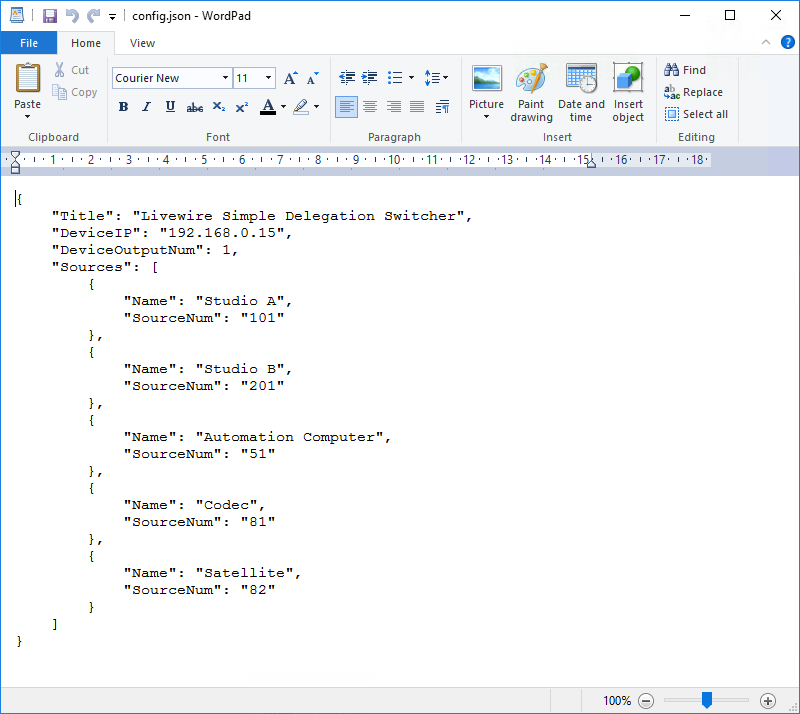 Livewire Simple Delegation Switcher is available as a free download – there’s no catch, no upsell, and no time limitations. The latest releases are always available on this page. This release adds support for Raspberry Pi, and adds further commands for GPIO usage. See the new config files, and the Media Realm website, for examples. For basic setup instructions, please see the README file. If you have any issues, please email me or create an Issue on GitHub. If you're using this software, I'd love to know! Send me a photo to have it featured on my website! Before you download this software, would you like to subscribe to occassional email updates? We'll inform you of updates to this software, and send you other interesting info. This is completly free software, so your subscription would really help us out. This release adds support for GPIO! Fix a bug where LWRP changes from other devices could inadvertently reset the switcher to source "0"
This release adds support for password-protected Livewire devices. If you don't password protect your devices, this won't be particularly useful - so just carry on as usual. If you're using this software, I'd love to know! Send me a photo or email! This release adds support for SIP Sources (as available in xNode v2.0 and other AES67-compatible releases). The sample configuration file shows you how to use this. Existing configuration should work as usual. If you're using this software, I'd love to know! This release now uses the latest version of my Python Livewire Routing Protocol Client. The main change is to fix a bug in parsing Destination Addresses. We now also include a Debug version of the EXE. If you are having the program unexpectedly crash (especially on startup), run this debug version from the Command Prompt. You can log an issue including the full error traceback, as well as a description of how to reproduce the issue. This update allows you to specify the title from within the config file. This is the initial release of the Livewire Simple Delegation Switcher. For basic setup instructions, please see the README file. If you have any issues, please email me or create an Issue on GitHub. Run LW-Delegation-Switcher.exe and try it out! You can use these two features together, or separately, or not at all – it’s totally up to you! 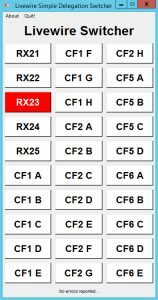 You can configure this switcher to be controlled via the GPI pins on a single Livewire device. It’s an input – essentially a way of controlling the switcher from external hardware. There’s a 1:1 relationship between GPI pins and Switcher Buttons in this app. Whenever a pin is pulled low, the configured button in the lwSDS app is selected, changing the destination audio. To configure this, configure global options ‘GPI_DeviceIP’ and ‘GPI_DevicePassword’, and source options ‘GPI_SwitchPort’ and ‘GPI_SwitchPin’. If you don’t need this option, delete the lines with ‘GPI_DeviceIP’ and ‘GPI_DevicePassword’ from the config file. Output Triggers are used to send GPIO changes when a button is selected. Think of it as an output from this app, which is only sent whenever you press a button. For configuration options, see the file ‘config-sample-gpiotriggers.json’. A UK TV/Radio News Network is using it as a source selector for their news operations. They have a lot of columns! This was one of the first installations of lwSDS – and lead me to implement support for multiple columns. A number of Community and Narrowcast radio stations in Australia are using it, including 2UUU Shoalhaven, Pulse 94.1 Wollongong, and Pulse FM Tasmania. TAFE NSW has it in their radio training studios in Ultimo, for studio delegation and headphone switching. 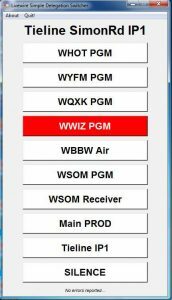 Tim Wright (from WLS, Chicago – a Cumulus News/Talk station) is using lwSDS – and has even modified it to run on a Raspberry Pi! A few people in The Broadcasting Club on Facebook have shared how they use it. 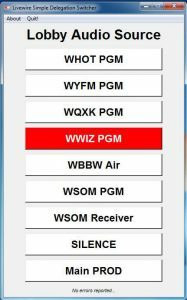 This includes Ben Slagle of the Cumulus cluster in Youngstown, Ohio who’s using it to control the speaker feed in their lobby. He’s also put it on their laptop for remote broadcasts, allowing presenters to control the return audio – genius! If you want to share how you’re using lwSDS, please email us. Alternatively, hit me up on Twitter.